I paste below a couple of pictures Hilary took while we were there, which I hope hint at the scale of the project and the diversity it contains. 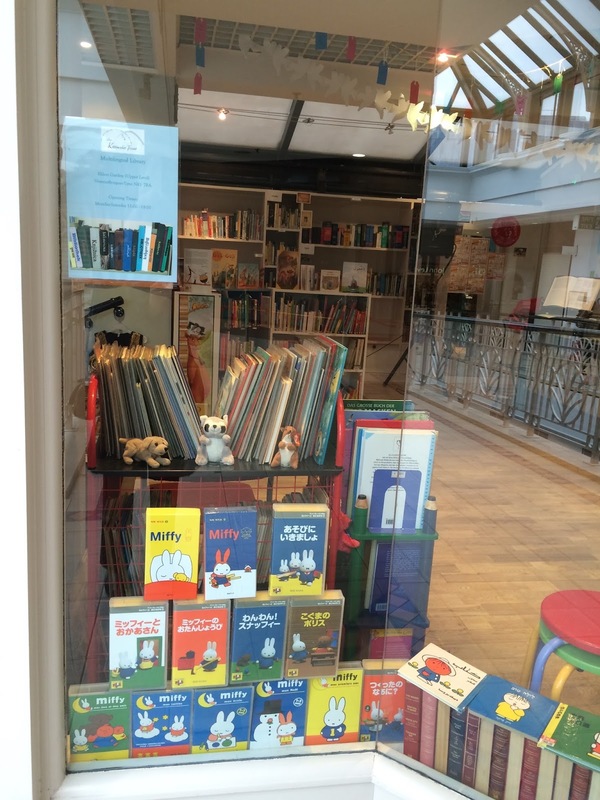 They have books in over 60 languages so far, aimed at all ages. Many can be loaned out. Membership is a fiver a year - and for those who would find even that cost too much, they operate the beautiful 'pay it forward' system, where those who can afford it pay in advance for those who can't, such as people belonging to local refugee support groups. Parents with children are welcome to drop in, and there's plenty of space to sit, read, and play, That was one of the most noticeable things about the library: its welcoming, colourful, playful atmosphere. There's more than just books here. Artefacts from other cultures are sprinkled about, and I imagine these will grow as the project develops. A particular delight was to see that the library doesn't restrict itself to language diversity but to dialect diversity as well. The Newcastle project has books on Tyneside dialects and other varieties of English, as well as local history - an important piece of PR, as many people unfortunately still can't see the point of bilingualism, but they begin to get an inkling when they realise that their own local dialect raises precisely the same issues of identity, pride, and cultural history. The library is on the upper floor of the Eldon Garden shopping centre, in the centre of Newcastle. If you travel by car, the entrance is on the seventh floor. That sounds like a long way up, but from the inside it's just an escalator ride up, round the corner from John Lewis. Its phone number is 07776 684940. Its website is here , and it's on Facebook. So, if you're in or around Newcastle, my recommendation is to call in and become a member or a volunteer. And if you have any spare books in other languages taking up space at home, a donation is very welcome. Many research studies have shown that learning more than one language is good for you - and learning lots of languages is especially good for you. Seven big pluses. By the way, the research showing the supposed cognitive advantages of bilingualism turns out to be as unreliable as the previous research showing its disadvantages (both a general part of the reproducibility crisis in the social sciences). Bilingualism is just normal, and people who have it seem to be neither better nor worse off cognitively than their monolingual counterparts. The social, cultural, and financial advantages (where there is no discrimination against it) are beyond doubt. Thanks for this example, John. Very interesting. I suppose several big libraries will have significant multilingual holdings. What I'd like to know is if there are any other examples of a library wholly devoted to multilingualism. I wouldn't go so far as to say that all the recent research cognitive advantage into is unreliable, though I take your point about the pendulum swing. For readers who want to go into this further: Grosjean's review of the issue can be found on his blog ('The bilingual advantage: where do we go from here? '), along with some refs to research (in a post on 'Dementia, later-life cognition, and bilingualism') which allow him to conclude that 'bilingualism does appear to have a positive effect on later-life cognition'. I've assumed, in that invisible way that one assumes things and doesn't even realise it until those assumptions are proven wrong, that public libraries in most countries were multilingual, at least to some degree. This must be because here in Finland all public libraries have books in many languages. Even the smallest local libraries serving small communities have at least a few dozen books in Swedish (second official language of Finland) and English, and a dozen in German, French and Russian as well as possibly some other languages. I think most of these languages have traditionally been 'on offer' so that Finns who have studied them at school can maintain and improve their language skills. Big libraries, like the one in my hometown, Turku (smaller than Newcastle) have books in dozens of languages. When I read this blog post I dug up an article I remembered reading about the Turku City Library's multilingual collection (https://www.turku.fi/uutinen/2016-02-08_kirjoja-omalla-kielella; unfortunately available only in Finnish, which is ironic considering its subject matter). According to the article, the Turku city library has books in 118 languages. These books include also children's books, which are in fact some of the most loaned books in many languages. Of course in the case of very many of the 118 languages there's only a small number of books in each language - but the library nevertheless aims at providing at least a few books in all languages that are spoken within the city (there are 103 of those languages). The number of languages that are catered for has ballooned in recent decades as the result of immigration. 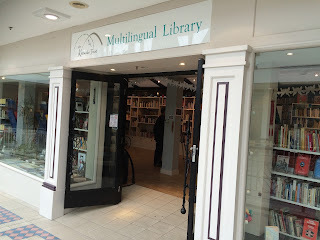 Having read this blog post about the multilingual library in Newcastle (which you mention is possibly the only one in the UK) I think it's quite admirable that Finnish libraries endeavour to offer reading material in all languages that are spoken in the respective communities, even if sourcing the books is often difficult. There's also a specialised multilingual library in Helsinki which serves the whole country - all other libraries can order books for their customers from the multilingual library's big collection. This comment became much longer than I intended, but I hope it offers an interesting comparison to the libraries in the UK. A really interesting perspective. Thanks for sending such detail. Here in Edinburgh both the large Central Library and the small local libraries for the most part have multilingual elements. There are shelves with titles in alien alphabets, which must include — at least — Chinese, Urdu and Bengali, since these are the reading languages of large immigrant groups. I haven't spotted Polish or other East European language shelves, but I'm pretty sure they exist. Of longer standing are shelves with French, German, Italian and Spanish books — catering to indigenous learners as well as the odd expatriate. What these books have in common seems to be that they are (mostly) for recreation. On the shelves where I can read the titles they are predominately prose fiction. On the other shelves there seem to be a lot of gaudy jackets, which suggests they're not the typical stuff you find on the non-fiction shelves in the rest of the library. I recently performed a strange errand delivery unwanted books in Italian to a group of language learners. These were a bequest which didn't coincide with Library plans: some novels, which presumably duplicated what they already stocked, plus the books of the late owner's interest. And since that interest was i theological tracts, the Italian-learning group were a bit bemused. This reminded me of a late friend and sometime colleague of my wife's who put in voluntary hours for a charity looking through books in Russian that had been bequeathed to a charity. He identified the books that could be sold to second-hand dealers, and the rest were sold for a pittance to pulp factories. What these two stories point to is that a breadth of reading material is for the first generation of bilingual immigrants. If their children and grandchildren are bilingual, they're selectively so. For any interest or hobby that they take up and for all but one object of study, they can comfortably read about it in English. This can be true of the first generation. My wife lived her first thirty years in Russia, but now that she's no longer teaching she never feels a need to Russian other than recreationally. A few years ago, she could have borrowed a range of books from the library of the Scotland-Russia Forum. But discontinued funding has caused them to downsize, until there was no room to accommodate the library and it was sold off. Edinburgh being a capital city, there's a French Institute with what used to be called a library. But now the money goes not so much on book stock as on DVDs. And the former biblioteque is now a médiatheque. It reminds me of the British Council Library at the time that I was working in Warsaw. Despite protest, they were rapidly selling off books to make way for computer rooms and the like. And even when they were 'proper' libraries, each was sacked with books that at least in part followed a nation\'s soft-power agenda. To be truly bilingual, a library needs extensive storage stacks for all the books that are unlikely to be requested more than once in a blue moon. To stock such a library, there's a niche for a volunteer organisation catering for all the charities that receive book bequests, which could sell the less popular books for a better price than the pulpers will pay. Volunteers can work wonders. I remember a delightful radio talk by a young American who spent his weekends collecting books in Yiddish from old immigrants whose children would never read them. Much of his time was spent listening to happy recollections of when the readers had in their youth located or saved up for each treasured volume. Speaking of the French Institute, there's language course I attend in the hope of slowly rising above my intermediate plateau. It's been based on press cuttings, but the format will have to change because the Institute no longer thinks it can afford newspaper subscriptions. Against this gloomy note, it's now possible for subscribers to Edinburgh Public Libraries to access online a huge range of newspapers and magazines from around the world.. In this area, if in nowhere else, this could be a golden age for multilingual library access. The Kittiwake library has announced that about 1/3 of their books are in English, which puts the matter at once far beyond that of large municipal libraries or even the Queens branch libraries. Further observations on the Hamlet H Quarto.